If you have brick – or if you've been thinking about seeing what's under the plaster at your own residence – this post is for you! 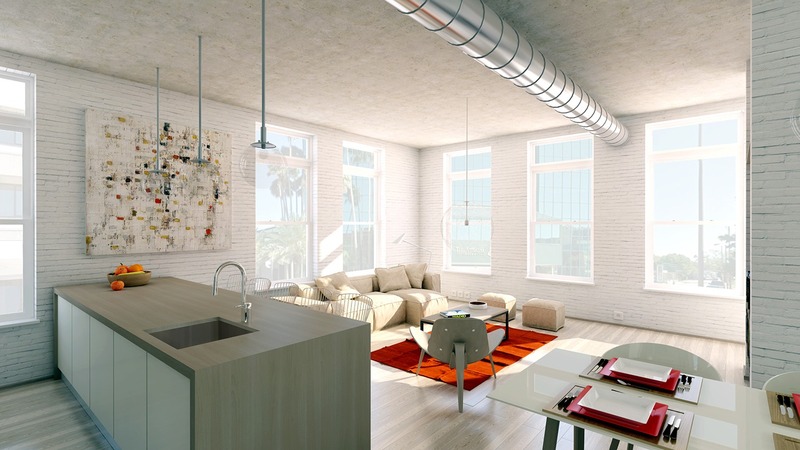 Original exposed brick is such a wonderful feature because it's classic but never outdated, it's nearly impossible to replicate, and with the rise of warehouse to apartment conversions it practically tops the list of hot but reliable interior design trends. Plus there's the added bonus of getting to see and feel the history of an older home. 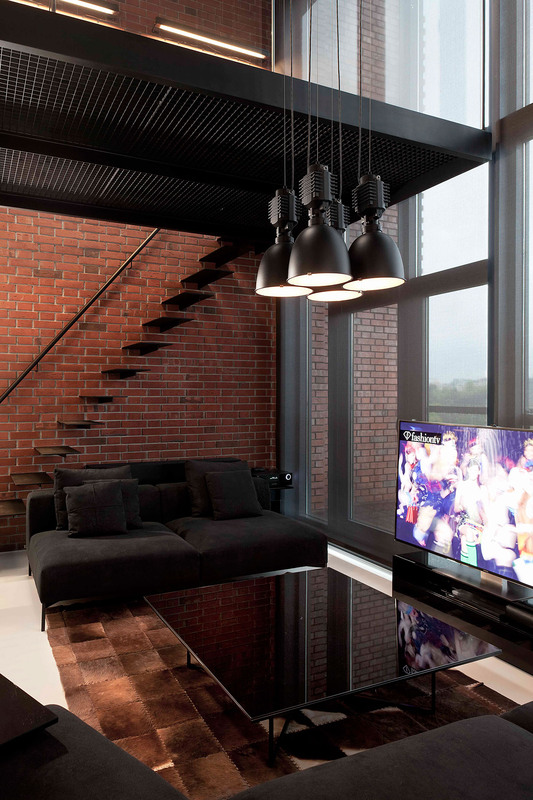 In the context of a newer build, distinctive brick walls can help imbue the space with a more traditional and homey feel than drywall could ever provide. 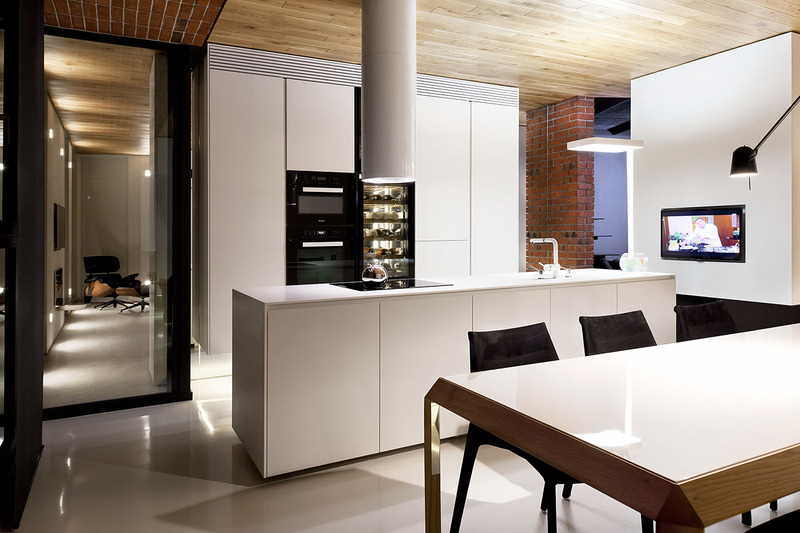 This first home features white painted brick with very crisp horizontal lines. The neatness of this brick is one of this home’s most hard-to-recreate features. 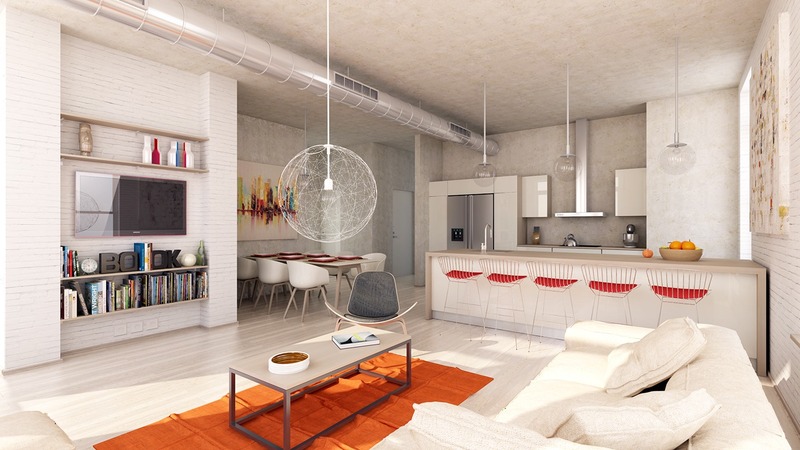 A concrete ceiling and light wood floors contribute to the light and welcoming aesthetic, with energetic orange accents for personality and charm. 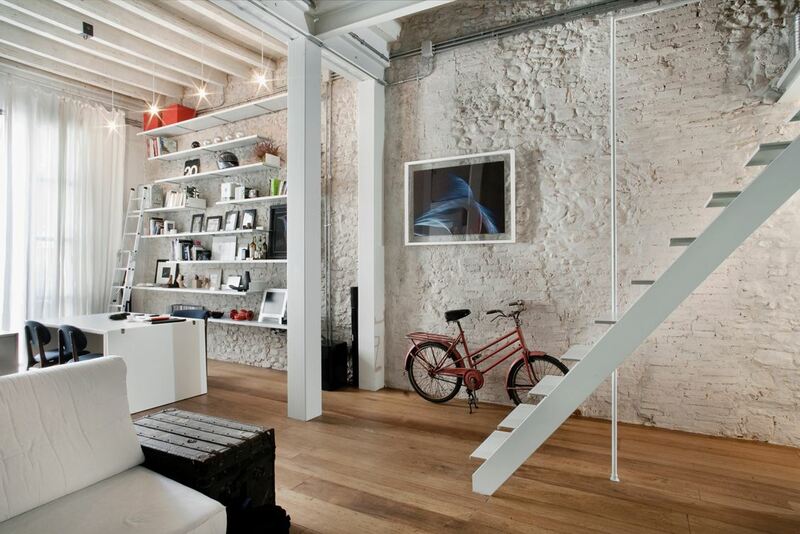 When it comes to art placement, this home has two restrictions: the brick, and the lack of interior walls. This painting echoes the shape of the brick but with a looser and more dramatic aesthetic. 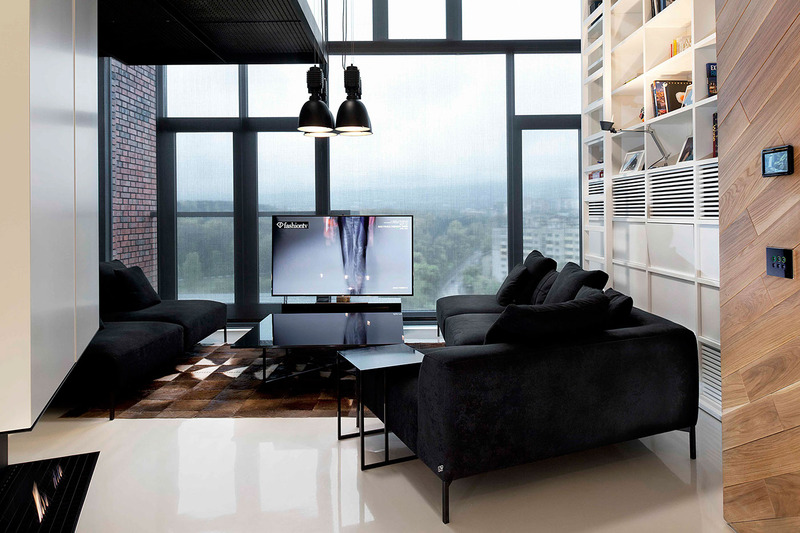 A chair intended for the center of a room should be evaluated to make sure it’s visually pleasing from every angle. Here, the iconic 3-legged design of the Shell Chair by Hans J. Wegner serves its central position well. 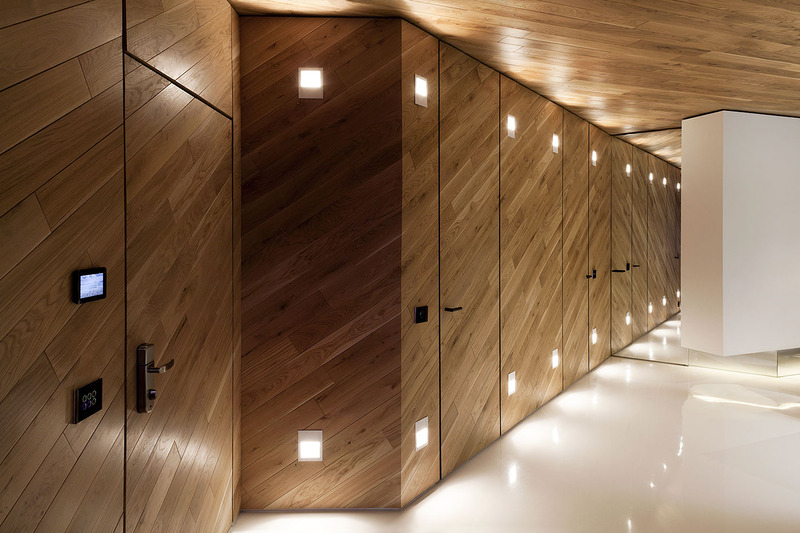 A single highly-polished duct traverses the ceiling and draws all the little metallic elements together. 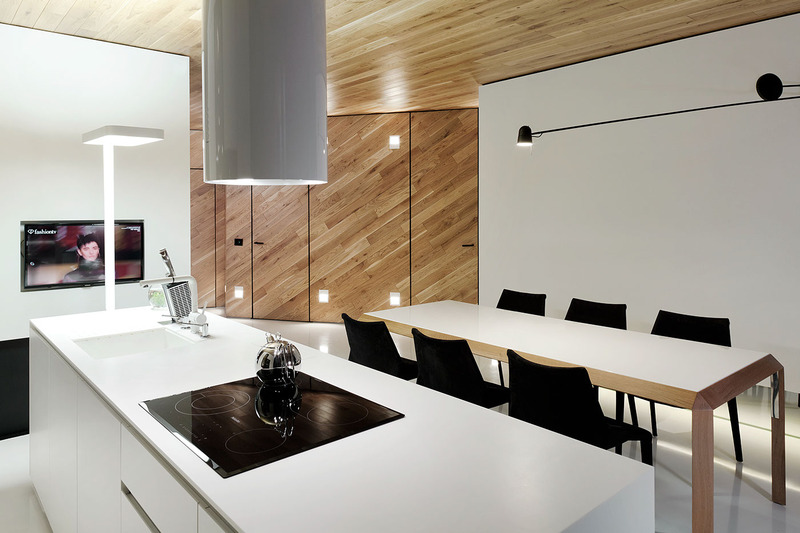 Its position helps to divide the living and dining segments of the home. 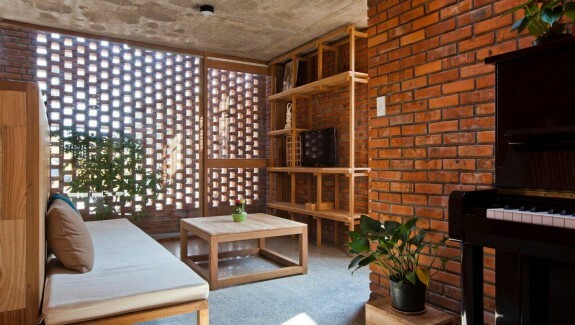 If you are specifically looking for creative ways to show off the brick texture in your living room do check out: 30 Living Rooms With Exposed Brick Walls. 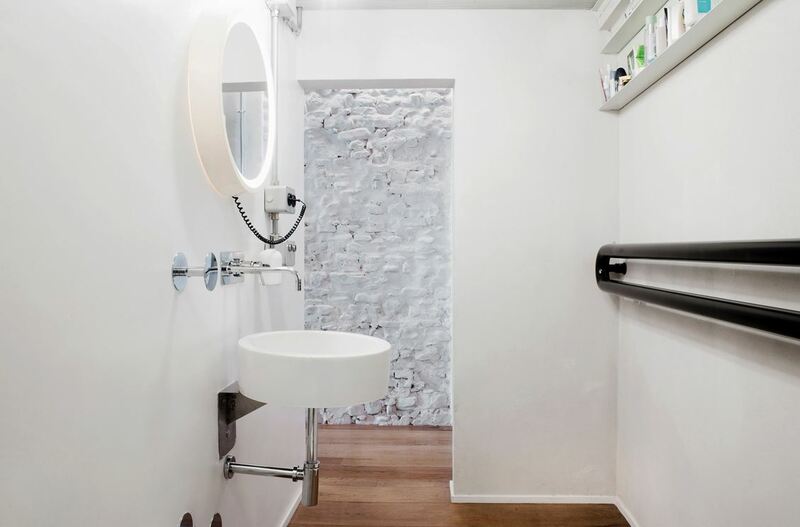 While the previous home featured painted white brick, this one goes in a completely different direction by embracing its dark and gorgeous natural brick assets. 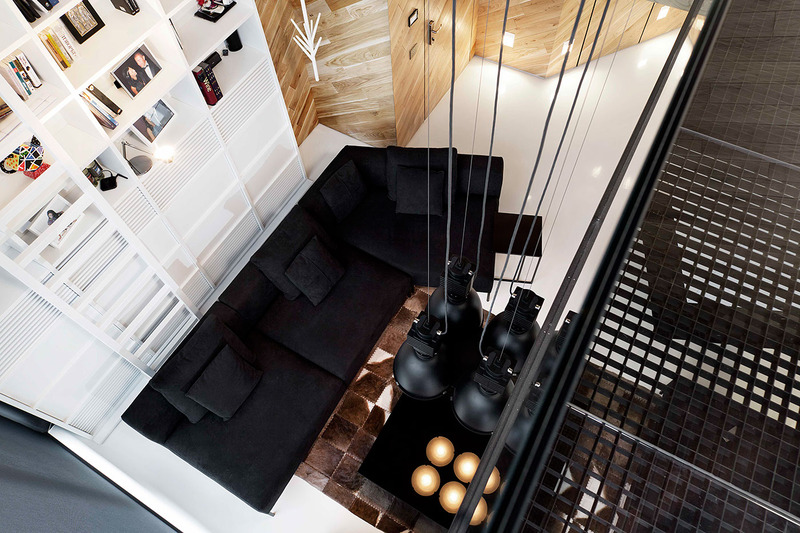 This initial view reveals a cozy living room and a set of thin cantilever staircase leading to a second floor. 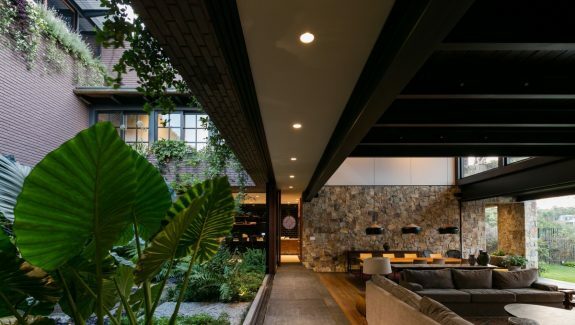 As stunning as the brick may be, this home features several ordinary materials used in surprising and interesting ways, like the diagonal wall panels on the far right. The library takes advantage of the double-height ceiling, accessible by a steep climb up a ladder. Certainly gorgeous but surely not for those who might be afraid of heights. Pristine white surfaces take over where the wood leaves off. 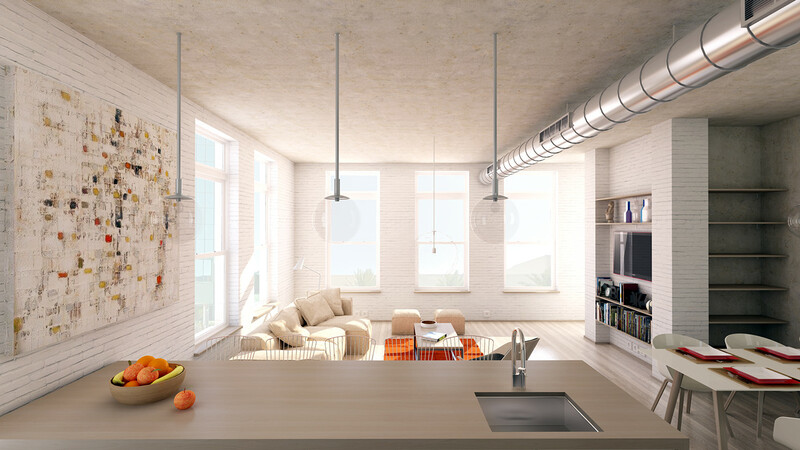 …and another exposed brick wall makes up the far side of the kitchen and dining units. 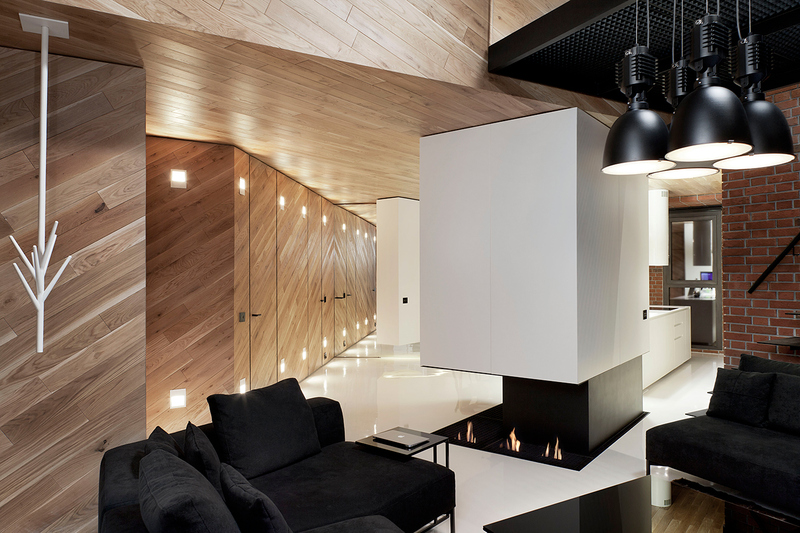 The layout is obviously quite unique – here you can see a large central fireplace splitting the triangular layout into two paths. One goes to the kitchen, and the other to the private hallway. 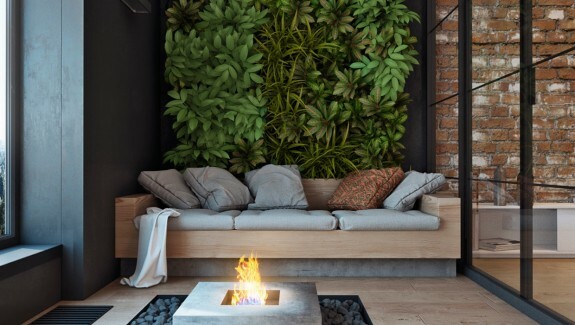 Besides the brick, other notable material choices include these fabulous wall panels in the hallway and the distinctive choices for the ceiling and floor. 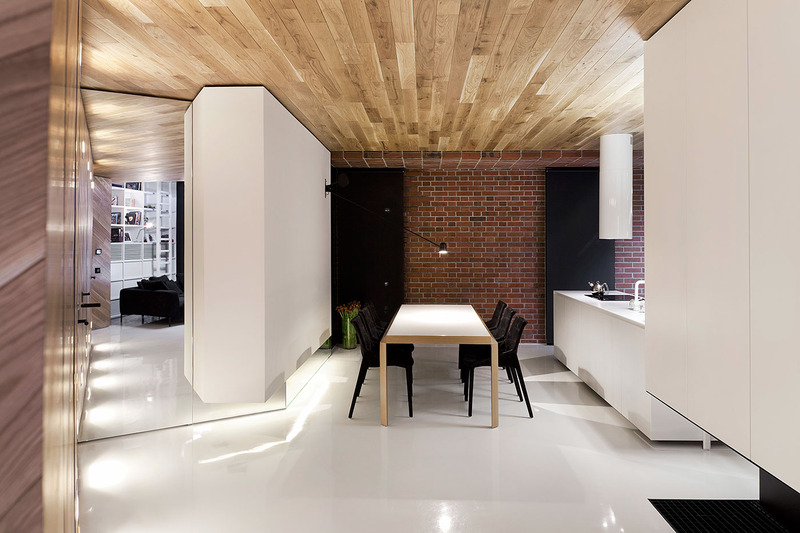 One might ordinarily imagine a glossy white ceiling and a wood paneled floor but this home switches the two around in a bold move. 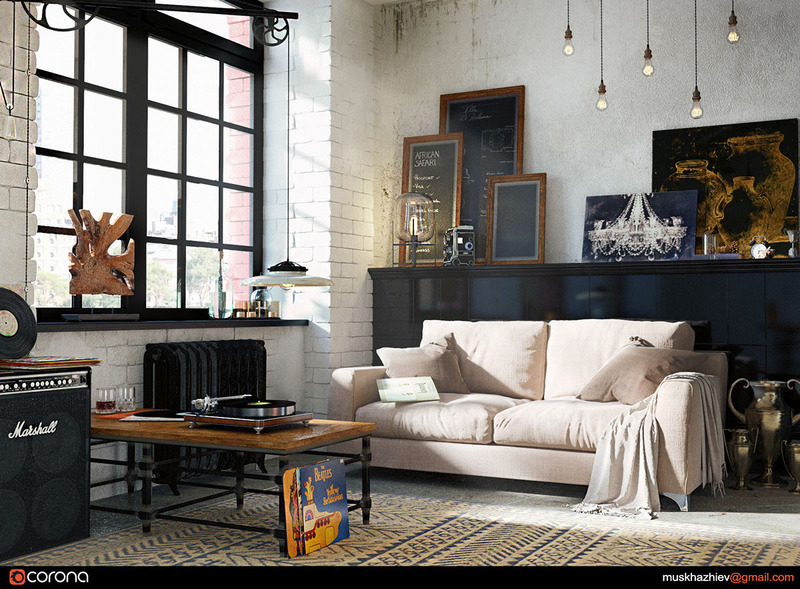 This eclectic Brooklyn loft combines classic designs, industrial elements, and natural materials. 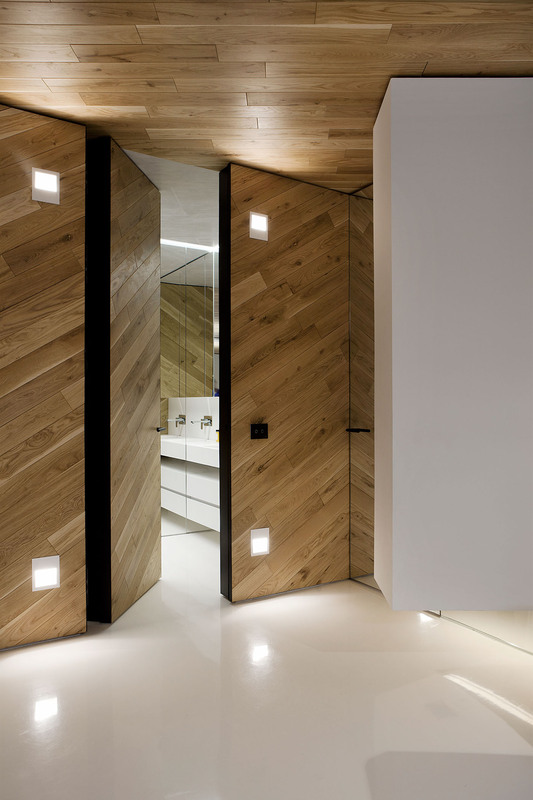 The resulting interior falls squarely between urban modernism and charming rustic style – a very welcoming look! Painted white bricks make up the exterior side of the walls, with their slightly-uneven depths making the overall aesthetic so much more charming. 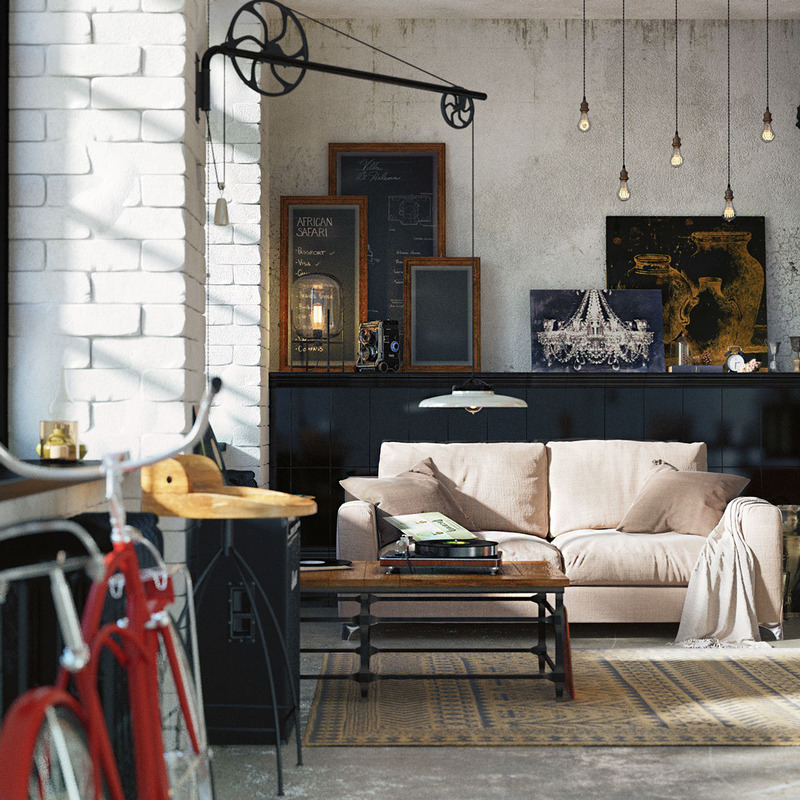 Some of the furniture has a cheerful farmhouse vibe, especially all the wood and iron items combined with Edison-bulb lighting. 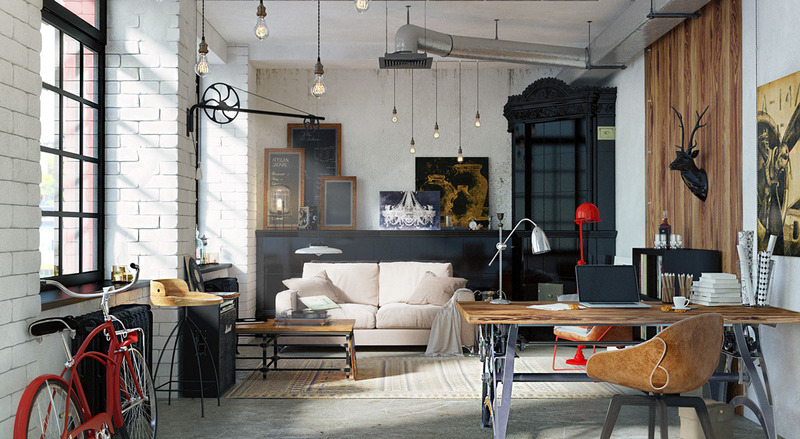 Our favorite feature has to be that huge industrial swing-arm pulley repurposed into an adjustable lamp. Other fun decor touches include the chandelier print in the background and the clever framed chalkboards to its left. The chalkboards might be a fun weekend project adaptable to any style. 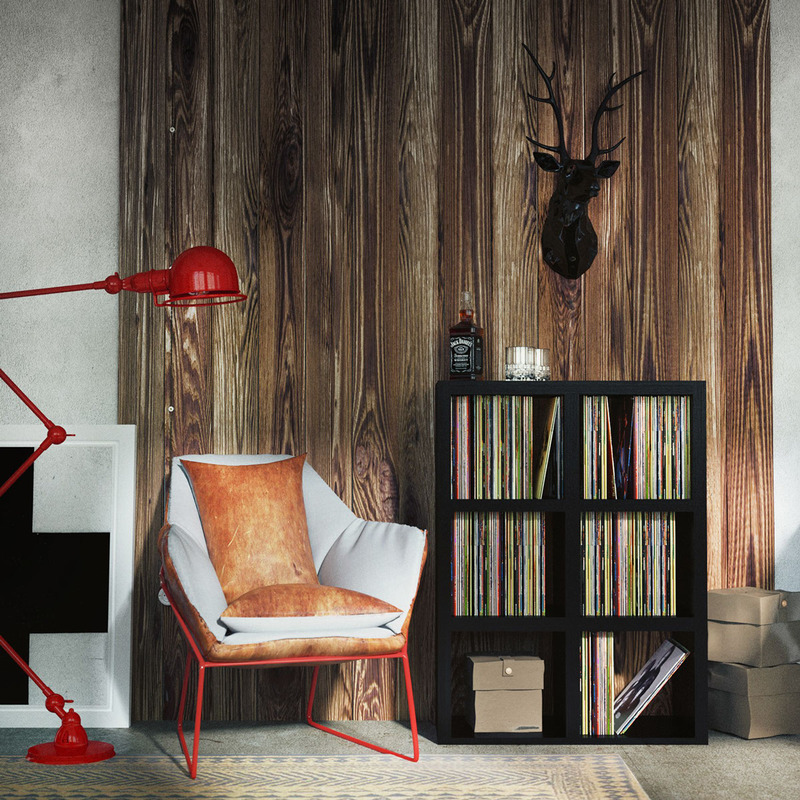 Some features are retro or rustic, but some items have an undeniably contemporary flavor – like this fun set of red accents. Distressed leather tends to bring to mind the smell of fine cigars and old books. 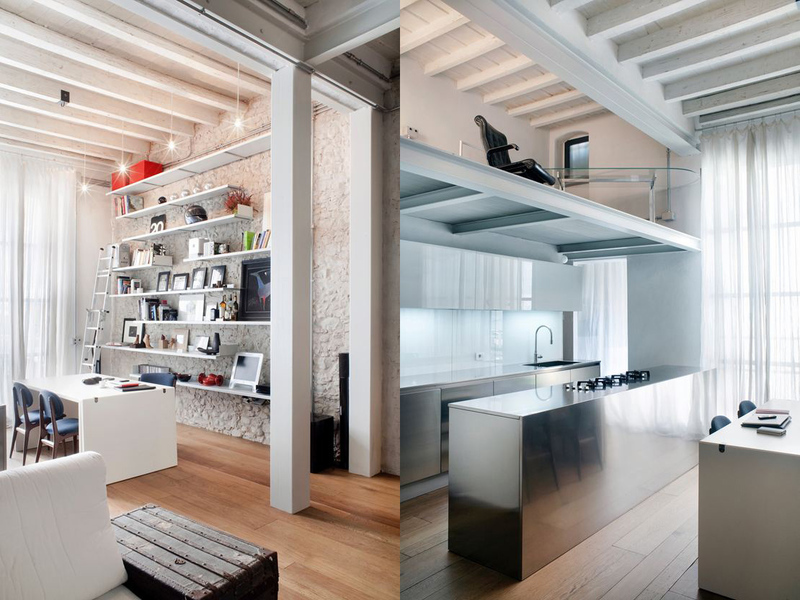 This loft in Florence is a former medieval convent with one-of-a-kind walls, built up over centuries of patching and layering and repairing. 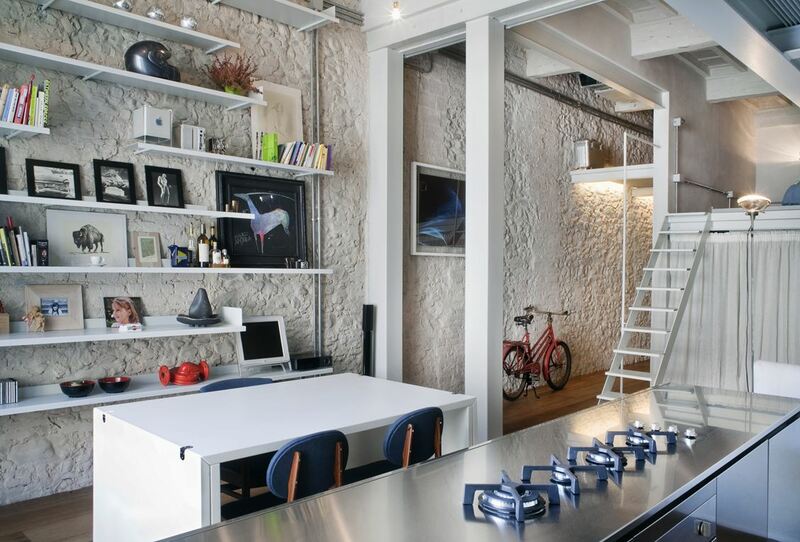 For the architects, the main challenge involved the labor-intensive process of revealing these original features and decorating around them to preserve the history of the space while making sure it felt contemporary and comfortable enough for a modern occupant. 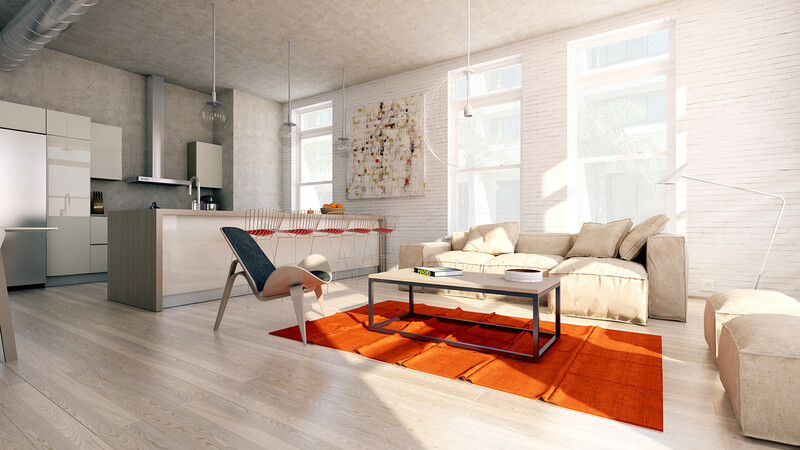 It would be nearly impossible to recreate this ancient blend of brick, stone, and concrete. 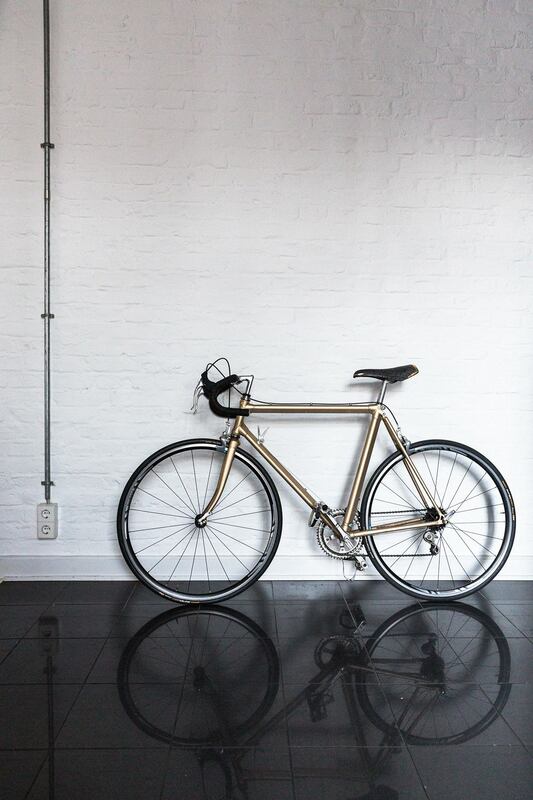 The fresh coat of paint unifies the diverse materials without obscuring their distinctive character. 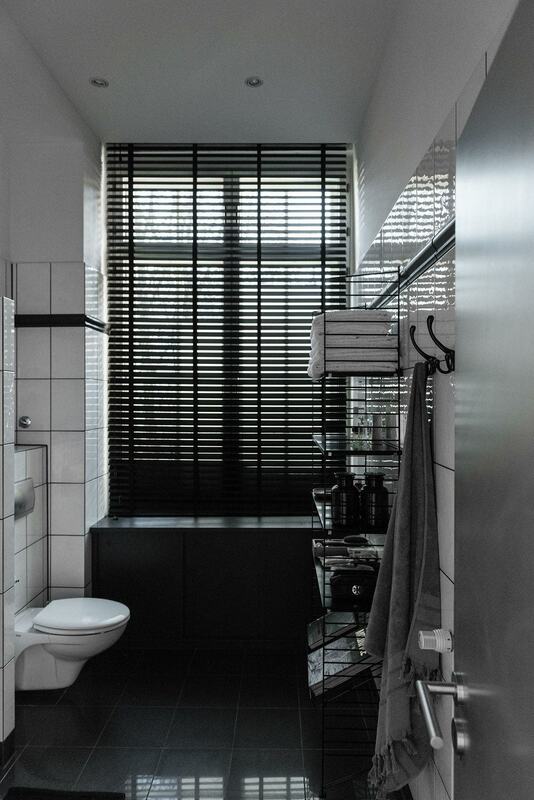 This unit originally featured only one window, so the architects removed as many interior obstructions as possible. 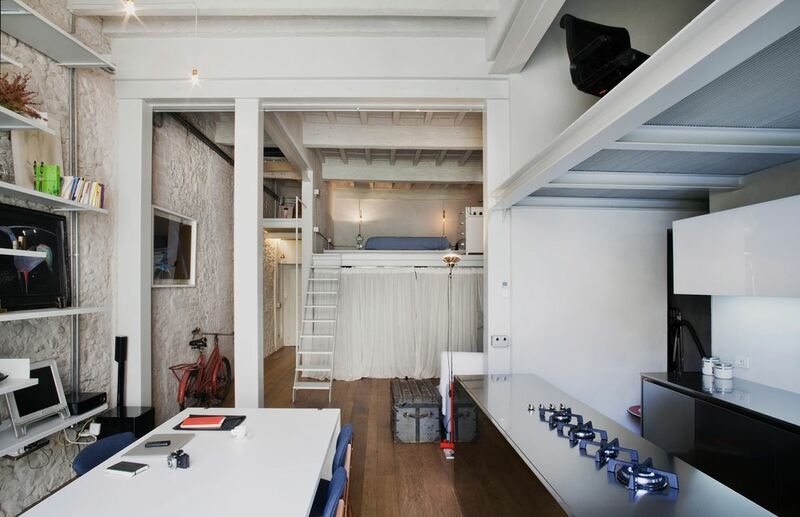 In the back, you can see a hint of a loft bed with storage beneath and to the right you can see an office hiding above the kitchen. 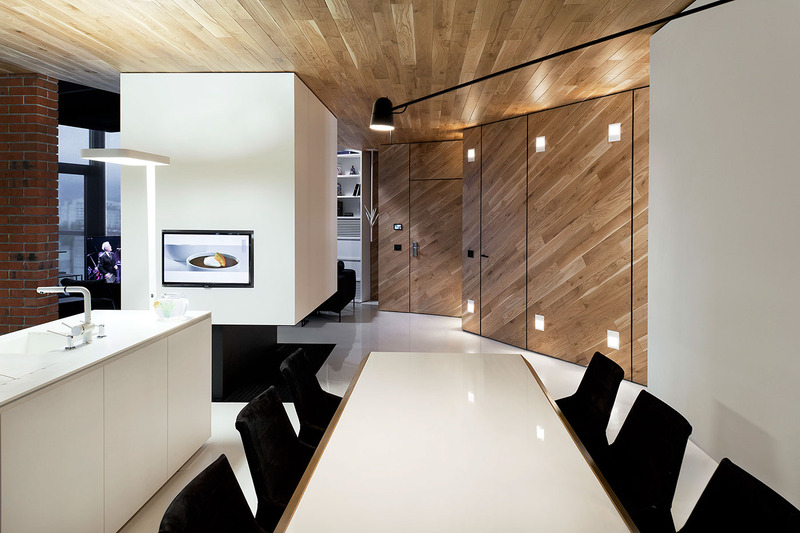 Notice the difference between the materials used on the sleek and modern kitchen side and the materials used on the classically-inspired dining side. Very dramatic! 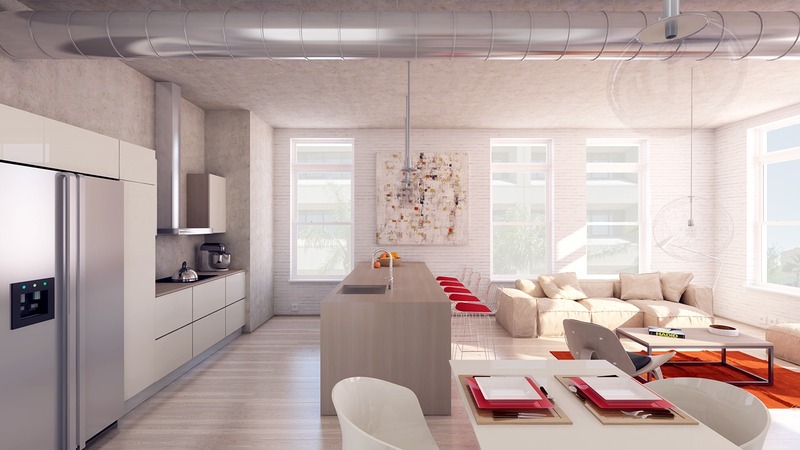 Here’s a loft apartment designed for a musician, complete with an included studio. 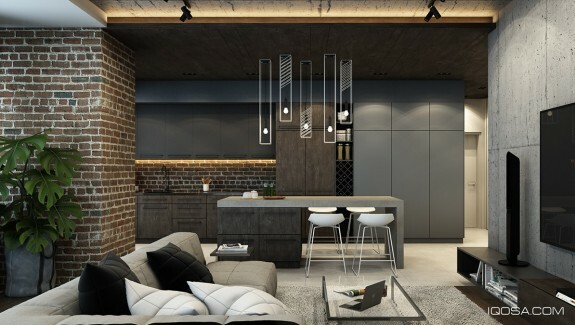 The brickwork in this space is much more subtle than in any of the homes featured previously in this post, with just the slightest amount of texture to hint that it’s there. 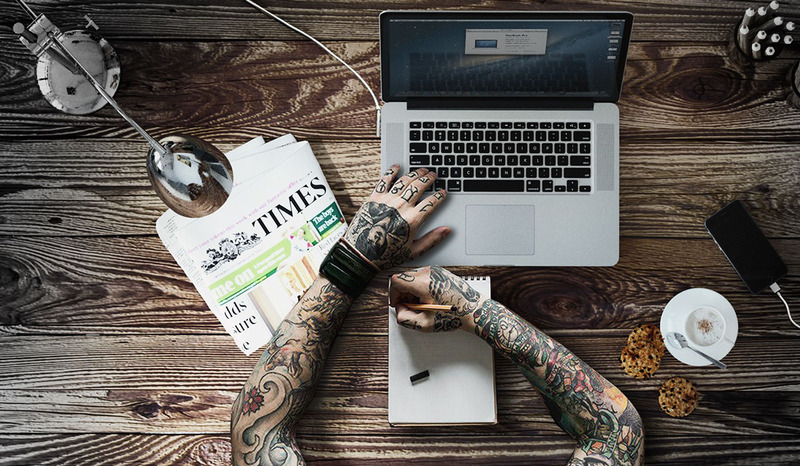 Some of the most creative features are quite subtle – it makes each unique detail more satisfying. 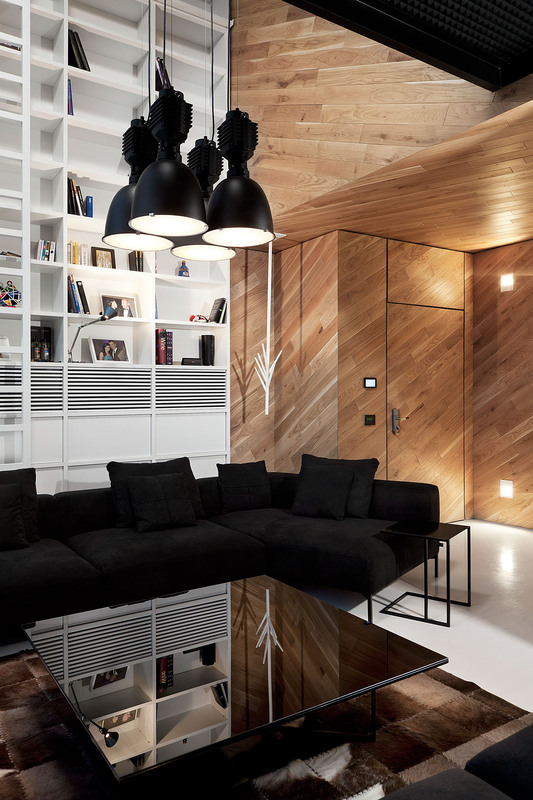 Notice the slightly rough edges on the ceiling beams above, and the distressed layered rug beneath the sofa. 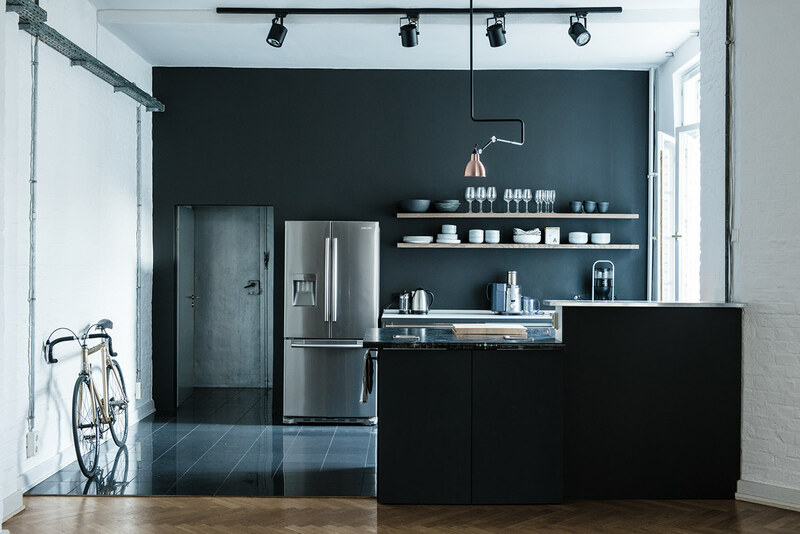 Flanked by the faint white brick, the kitchen makes its mark with a matte black accent wall and glossy dark tiles, different from the rest of the home. The walls aren’t too plain: in fact they’re perfect for highlighting the lovely artistic objects found here. 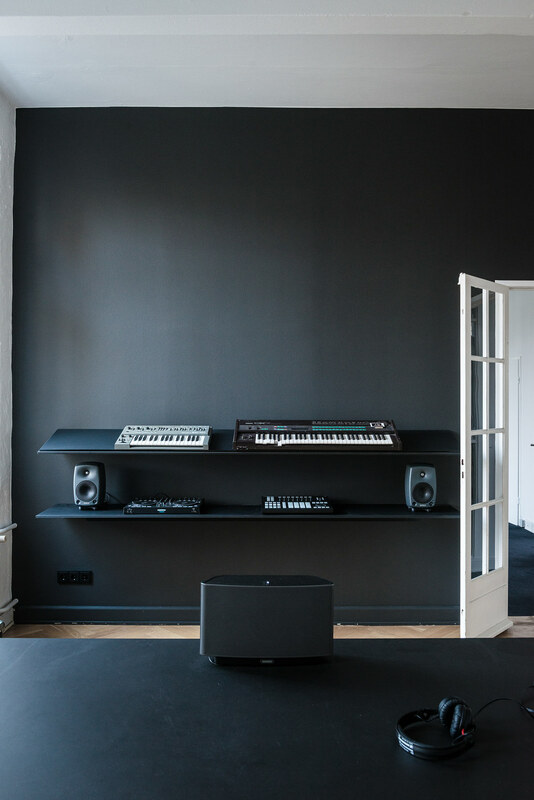 Another black accent wall makes its appearance in the studio. Notice the clever organization bins to hold countless cords and accessories below the workbench. 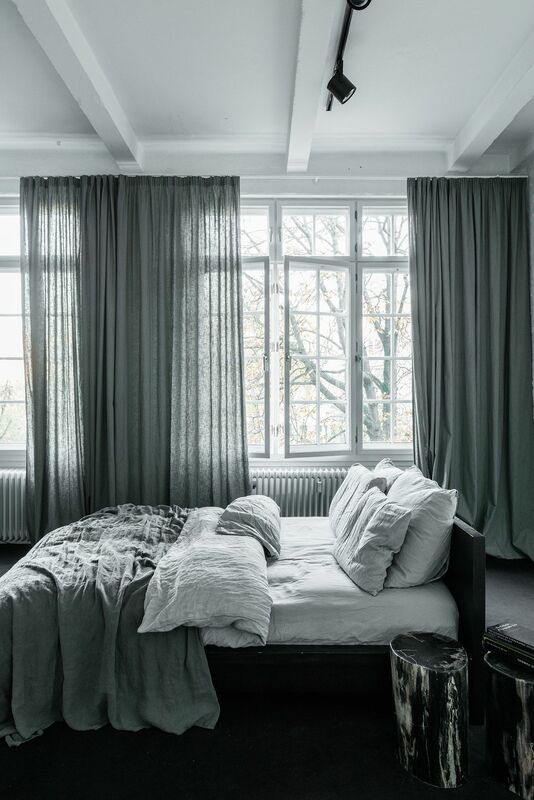 Lightweight fabrics make the bedroom look unbelievably comfortable in every way. 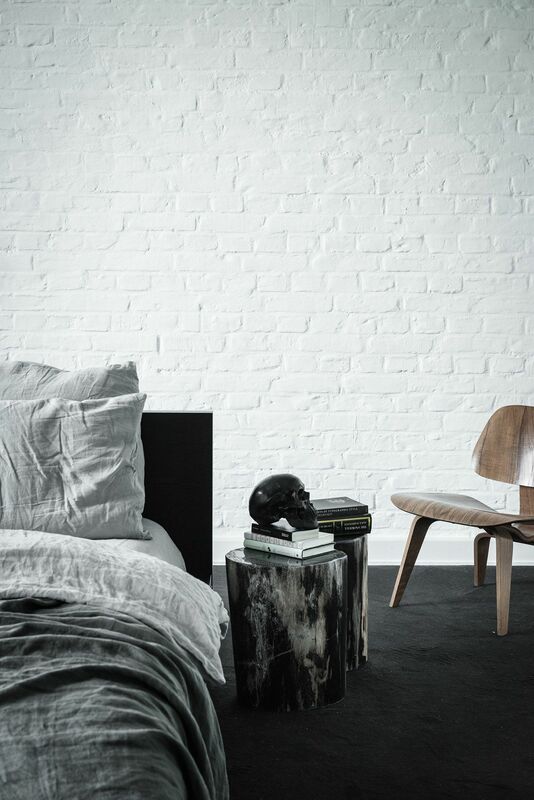 If you are looking specifically for exposed brick bedroom walls, do check out our post: 40 Bedrooms With Exposed Brick Walls. Stylish dark accents give the dining room an intimate and quiet aesthetic. 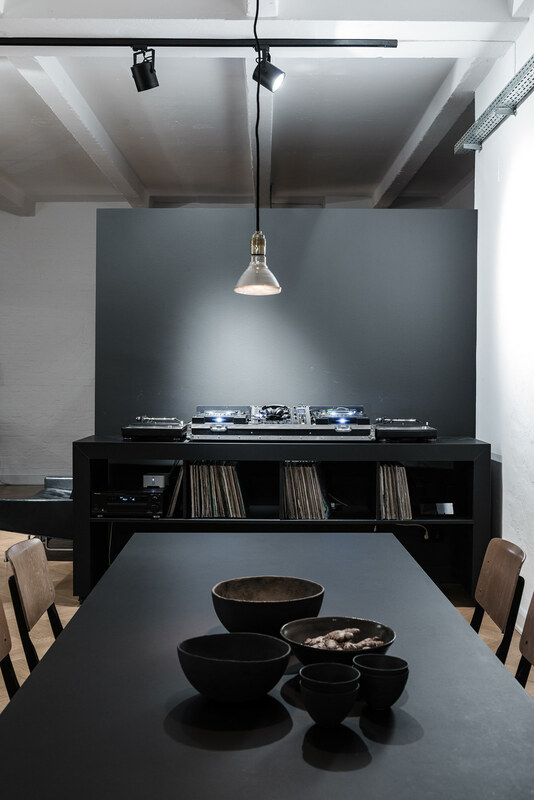 Hand-formed bowls and musical equipment gives this space a personal touch. 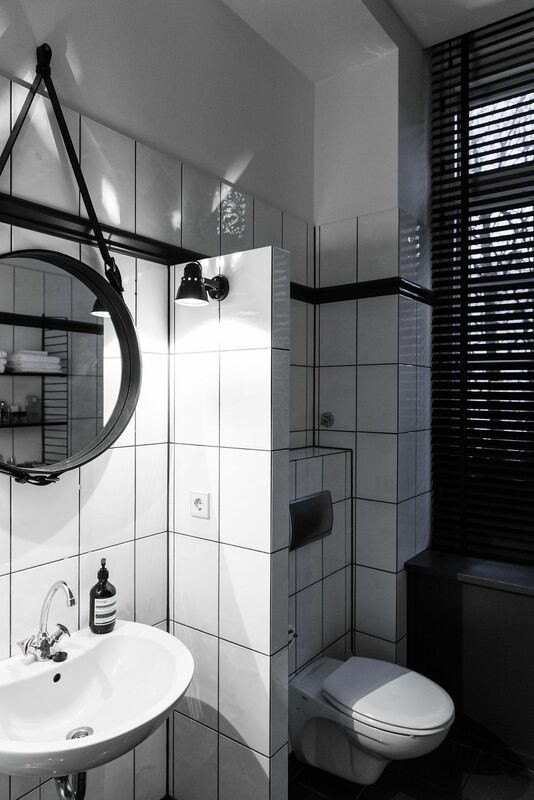 The black and white bathroom boasts a singular yet fantastic focal point: that attractive back leather hanging mirror.